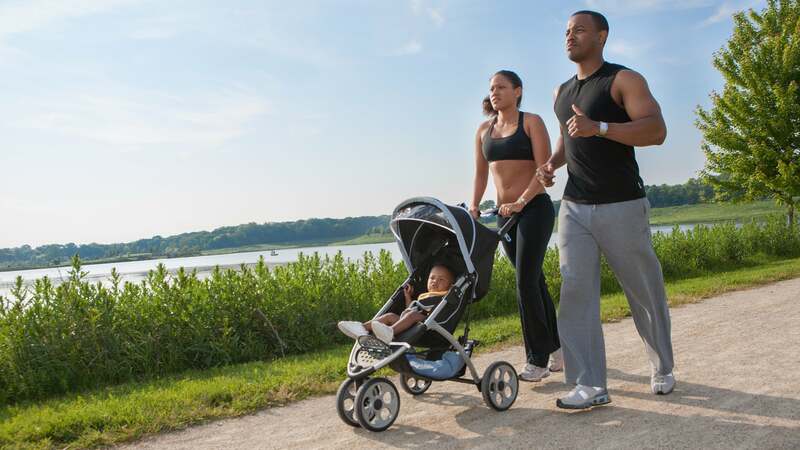 A jogging stroller is an aspirational purchase. You think, I'm watching the kid, I need some exercise, I'll just buy this smooth-rolling baby carriage and presto, an easy, close-to-home workout. And yet — it's kind of cumbersome to push, isn't it? Are you supposed to keep your hands on it at all times, or push it a few feet ahead of you and then catch up? Alternate arms or get one huge overdeveloped arm and shoulder? And wait, is the baby crying? Hmm, it's easier to just walk. And look, there's a cafe that sells 2,000 calories of froth in a 1,100g cup. And there's a comfy chair, and someone left a paper behind ... and before you know it, you've whiled away the morning with no exercise and a unpleasant sugar jag. "The same 30-minute jog that would have burned about 360 calories for a 68kg man or woman without a stroller should incinerate closer to 380 now, an amount that is small in terms of each run but cumulatively could contribute to weight control and improved fitness." You had me at "weight control". Maybe I'll jog to the cafe and celebrate with a zero-calorie cup of coffee.